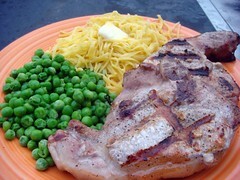 We eat our own pork chops all the time, and man oh man are they ever tasty. Pastured pork is so different from factory farmed pork that I can hardly call it the same thing at all. I like to cook it on the grill with just a little salt and pepper, nothing else, until it’s still pink inside. Yum. I paired it with the homemade egg noodles I made earlier this month and dried, and fresh peas from the garden. 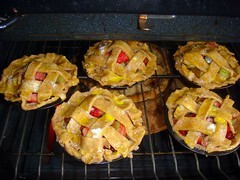 For desert, I made strawberry rhubarb pie with fruit from the farm stand in Alstead. I tried a new to me thing for the crust this time. I used whole wheat pastry flour from King Arthur (so glad that’s within 100 miles of me! I love to visit their mothership) and half vodka and half water. It came out really well. I remembered to shred my butter on a cheese grater, which always helps my crusts come out flaky. I liked the flavor of this crust with the whole wheat pastry flour — sort of nutty in a nice way. Yeah, I used all whole wheat pastry flour, and though it looks like a whole wheat crust in that the color is right, it really came out amazingly tasty and flaky. I’m not sure if that’s the all butter I used or the vodka, but I’ll definitely try it again. I had the same experience with lard as you have. Maybe I should try it with the half vodka and see how that comes out. Your food-related posts are so inspiring. I haven’t been doing much “homemade” lately, but now, I’m going to have to go make some pie!